A slider is a control that provide a standard way for the user to select a value from a predetermined range; for example, if your application needs to let the user pick a value between 1 and 100, it's easy to create a BSlider object that the user can use to do this. Sliders can be either horizontal or vertical. BSlider objects also provide a wide assortment of hooks that let you customize the appearance and behavior of your slider controls. This creates a slider named "const:slider1" with the label "Construct Speed (%)" above it. The range of possible values for the slider is 0 to 140. In this example, SetHashMarks() is used to specify that the hash marks should be below the slider; you can also specify B_HASH_MARKS_TOP to put them above the slider, B_HASH_MARKS_BOTH to put them both above and below the slider, and B_HASH_MARKS_NONE to omit them entirely (which is the default). SetHashMarkCount() is called to indicate that you want 10 hash marks spaced evenly across the slider. This sets the label for the minimum value (the left end of the slider) to "Slow" and the label for the maximum to "Fast". 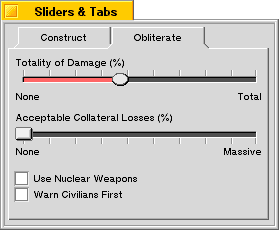 The result is the "Construct Speed (%)" slider in the window pictured below. An example of a slider with the B_TRIANGLE_THUMB thumbType and hash marks above and below the slider is also shown. You can customize the appearance of your BSlider by overriding virtual functions in the BSlider class that are responsible for drawing the slider bar, thumb, focus mark, and hash marks. // and the offscreen view. All rendering of a BSlider is done into an offscreen view, which you can get a pointer to by calling the OffscreenView() function. This improves performance and makes drawing the slider—especially complicated ones—look much smoother to the user. This code gets a pointer to the offscreen view, then renders a round, beveled thumb into the offscreen view, filling the thumb's frame rectangle as returned by the ThumbFrame() function.